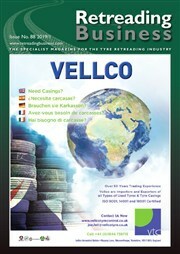 Retreading Business is the world's leading specialist magazine for the tyre retreading industry. Since its launch in 1997, the magazine has achieved a position as an important opinion leader in the retreading sector, focusing on events and developments within the global market and providing a range of technical, legislative and marketing information to the industry. So, if you want to find out more about the retreading process or are looking to source retreading equipment, tread rubber or other products used in retreading plants, then you are in the right place.